We stress over the hardships; but life is what is. It always will have troublesome moments. Happiness comes and goes; just as sorrows. Once we accept these inevitable truths, the impact of troubles diminishes. Our lives are composed of a wide spectrum of experiences. Some experiences pleasurable, and some very painful. We can favorably change the balance between the pleasurable and painful moments but no matter how healthy our choices or how skilled at living we become, we can’t eliminate pain. We live in an impermanent and unpredictable world. We lose people we love and encounter circumstances that disrupt. We suffer from disloyalty of people we trust and fall victim to violence and theft. Life may change without warning, destroying well-laid plans, sending our futures into a spin. But even through the chaos, we can grasp peace and experience joy. The list of life-disrupting happenings is long. We can prepare and avoid some. But our work isn’t paving an easy path through the world. Well-being requires a balanced front of avoidance and patience, minimizing pain while increasing skills to process the disruptions. We must artfully face unwanted changes, dreaded endings, altered plans, unfairness, suffering, disloyalty and lack of love while still maintaining the ability to love, give, and find inner peace. By our acceptance of life on life’s terms, we learn from experience rather than regret it. Life becomes an endless adventure, with a wonderous spectrum of emotions. Experience becomes richer, and our openness expands. 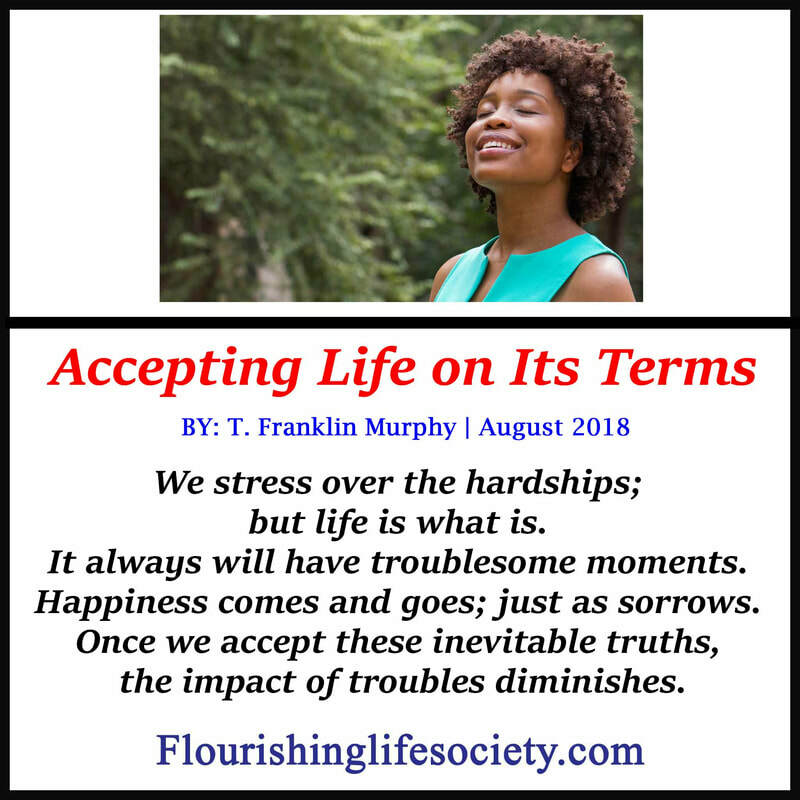 When we are overly burdened with a strict set of rules dictating how life should be, we feel an adverse reaction with a constant flow of disappointments. The unrealistic expectations create conflict with the world. By accepting life as it is, we process the unpleasant givens in a more flexible way. When we do not dread what is, we better attune to the inherent conflicts. We experience through emotions. We feel sad when losing something we cherish, we feel angry when treated unjustly, we feel joy when experiencing safety and appreciation. We respond emotionally to the world. Some people are more aware of their experience. 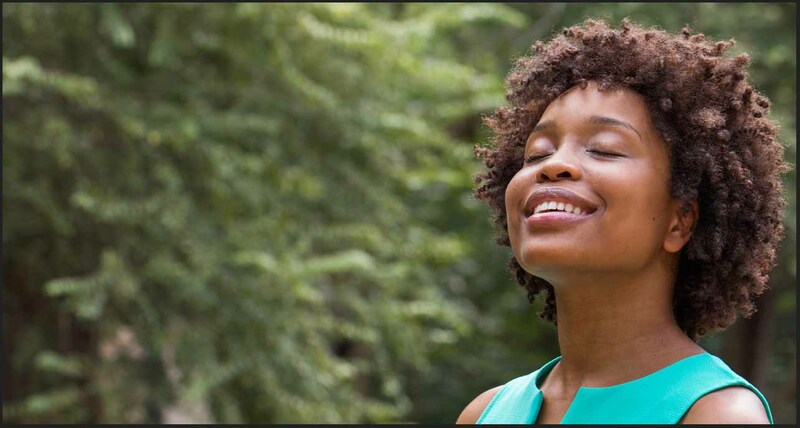 Others have disconnected from much of the feeling of living; but we all emotionally respond to events whether we consciously detect the emotions or not. It doesn’t matter how healthy we are or how skilled at the task of living, we will continue to experience life through pleasurable and painful emotions. Some philosophies preach that we should disconnect from the world to mitigate the emotions. This may work for some. Personally, it’s not the life I prefer. I enjoy the richness of emotion. I have discovered that traditionally discomforting emotions lose their sting when we welcome experience, understanding sadness and hurt are acceptable. We welcome feeling as a part of normal interaction in an unpredictable world. By embracing life as it is, we open ourselves to the possibility of betrayal. We accept that by allowing people into our life, we become vulnerable. We understand that with hopes, expectations and desires also comes occasional disappointments. We also understand that efforts directed towards achievements occasionally lead to discouraging failures. I admit, I don’t sing at my first waking moments, "I am so glad to be alive." Some morning I am tired, discouraged or sick. I would rather wrap myself up in a blanket and go back to sleep. Most mornings, I don’t. I get up and live, experiencing a multitude of underlying moods. I enjoy and appreciate the days where the whole world appears sunny and bright, yet those days come and go. I bless them, enjoy them and then without greed allow them to leave. There are also days full of dull grey which pass my way. I accept them also, gather wisdom and allow them to linger without fruitless resistance. I understand all days—good and bad—are part of an emotional existence. I know each day will pass; and with this knowledge, I avoid the hopeless desperation of never ending grey days. The feelings will change. My moods will vary. When we hurt, we may not feel gratitude for the wisdom being imparted. I don’t revel in these moments. We can compassionately allow ourselves to hurt without complicating the feeling with harsh judgments, scrambling desperately to deny the hurt and force joy. We shouldn’t feel guilty for not being stronger, more courageous, or impenetrable. I understand that hurt provides the opportunity to gain wisdom and strengthen compassion for others. It gives us patience to embrace others in their moment of hurt. The pain we experience allows us to understand our humanity and vulnerability to the world. It’s through vulnerability that we discover the sweetness of comfort and companionship. We cause much of our own pain by wasting energies trying to eradicate the natural feelings of living, denying reality, and hating emotion. We wrongfully hope for a world devoid of pain. We then compare the imperfect world we live in with this unattainable ideal and are disappointed. The more we fight reality, the greater the dissatisfaction. The world, just the way it is, offers much beauty. We can stand in breathless curiosity, respecting life on its terms, welcoming the whole array of emotions flowing from this wonderful and challenging experience.